Santa has spoiled me and (scoop) Santa lives in Golden, Colorado. obliged to sale that great knife as Second since the wood handles has cracked. FYI I got some friends who had moved from San Francisco to Denver and all their furnitures had been ruined. In beautiful Colorado, high altitude and continental weather can be destructive on wood furniture and wood handles. Thea, as a Norvegian Skogkat is inspecting carefully that Scandinavian ground blade. the Revenge of the Bushcrafter ! G10 is a very strong material, it won’t crack. Some blades are even made with G10 as a composite layering the steel’s edge or as full G10 undetectable weapon. G10 is epoxy mixed with fiberglass. It’s impervious to weather, choc, low tempetures, chemicals and is used in tactical knives for twenty years. For a non conoisseur, the G10 slabs on the Bushcrafter would look almost like hard dark wood. They are absolutly gorgeous ! 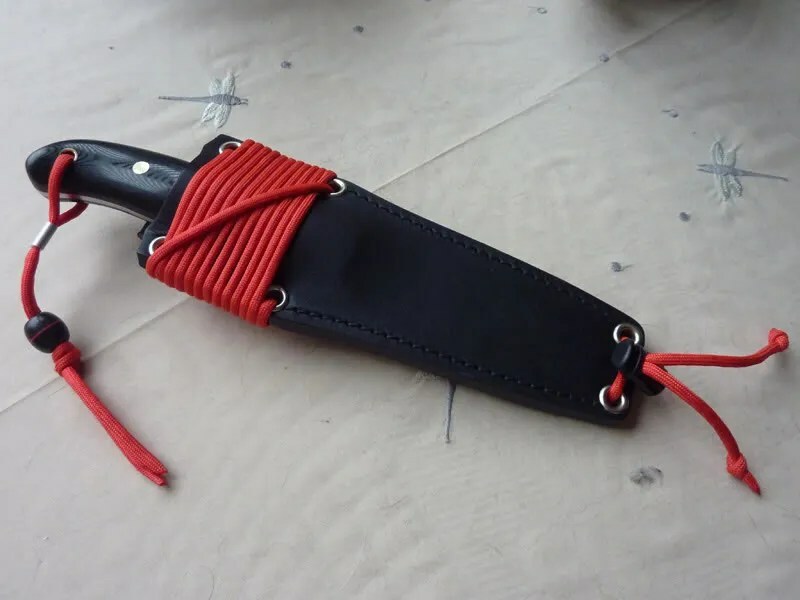 Leather stropping is Scandinavian Ground knives best friend ! The handle of that knife is a state of art in ergonomy. This a a splinter free design which turns any hard work in sheer pleasure. The design of the Bushcrafter is really well thought, providing a extremely well balanced knife with an ultrasharp grind. Chris Claycombe has made his homework as far as I have used my BuscraftUK Second all summer in France and Tuscany, the knife has always performed beyond my expectations. Both of my Bushcrafters. Notice how the edge of the wooden one is polished by stropping. The heat treatment, as always with Spyderco products, is simply top notch. The scandinavian ground knife stays sharps in various hard tasks and only needs some stropping to be kept razor sharp. My first Bushcraft is almost mirror polished on its scandy edge now. As confortable as it looks good. I have noticed “Taiwan-Taichung” is now written on the blade. they are the ones who only swear by Maxpedition bags… all made in Taiwan !! The Taiwanese craftmen chosen by Spyderco have proven to be some of the best knive artists and manufacturers in the world. The G10 Bushcrafter screams pure quality, attention to detail and reliability in a compact and solid package ! And that knife is really international: designed in the UK, produced in Colorado and manufactured in Taiwan ! 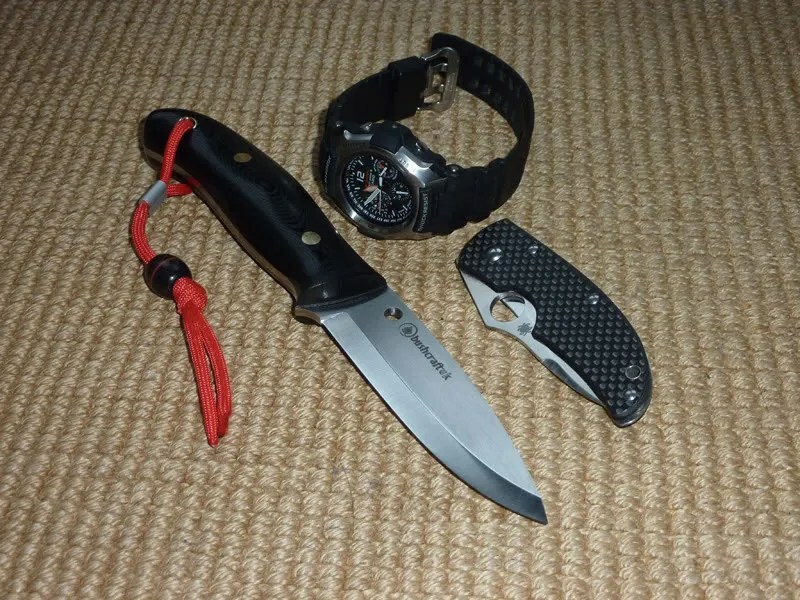 My EDC equipment: the C22 Sprint Run Michael Walker, the Casio GW2000 Gravity Defier and the G10 Bushcrafter. The leather sheath is now black. I love that sheath which is really suiting my need toward that design. Again a plastic foam encapsules the blade inside the leather. Under it “classic” look that ambidextrous sheath is really well thought and modern too. All in all the G10 version was itching my wishlist since I was so in love with the previous wooden handle version. Now this is going to be some kind of “elegant tank”, capable to withstand all hard used and batonning imaginable. That kind of knife is really perfect from light chopping to precise whittling. Again, attention to detail is extraordinary. But the G10 version is already hidden in my EDC Bag ready to carve some more turkey on the New Year Eve ! Also as a writer of the “Richard Blade” adventures for Gérard de Villiers, I have equipped that MI6 Operator with a Military Ti but for his new adventures for issues #199 and #200, he has a G10 Bushcrafter as main survival tool. Lucky man. The bead on the lanyard is a real genuine Fuzzyedge bead which adds a real touch of class to the whole package. Click here if you want to know more about the gorgeous creations of Fuzz’ via the USN Forums ! In concern of the design, Sal Glesser became interrested in Bushcraft at one of the three Spyderco meets he did in Sheffield, UK for his UK followers. Many of them were also interested in Bushcraft and questioned why Spyderco would not enter that specific arena ? Sal and Jur met Chris there and he showed them his Bushcraft design, which were different from the Ray Mears (*) design, and Spyderco started talking knife with Chris. 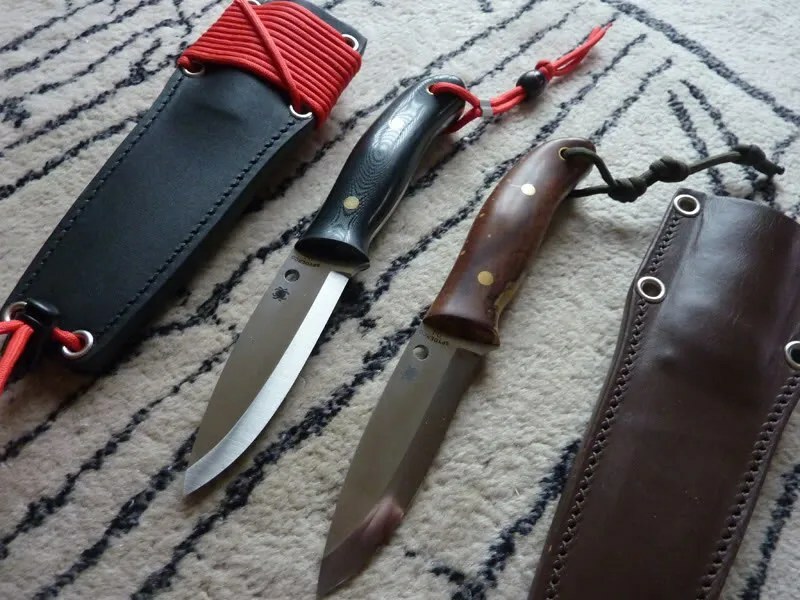 They developed the very special and ergonomic handle shape and decided to go on with all the “classic” Bushcraft features: a natural handle, scandi gring, tool steel and a leather sheath. At that time Spyderco manufacturing was running on the top of its capacity and they could not produce the Bushcraft knife in the USA. Japan was also (and is still) at the top of what they could handle for them. (Spyderco works with small family businesses in Japan). Japan was also too expensive. Sal has already established contacts in Taiwan and went there with the Bushcraft project. The quality of work they provide is, as noticed since, simply top notch. It’s evident to state that currently, there is no other factory made Bushcraft knife on the market with an handle so specifically shaped for the hand, as the Spyderco FB26P. (*) Another thing to remember is that Ray Mears is NOT a knife maker nor a knife designer. He is in fact a TV host and a business man who finds his customers through his televised adventures and stories. If you would like to collaborate with him to endorse any outdoor style products, you first deal with his agents and then with his marketing lady. As they have lot’s of success and they are asking high commitments, also in terms of money…. 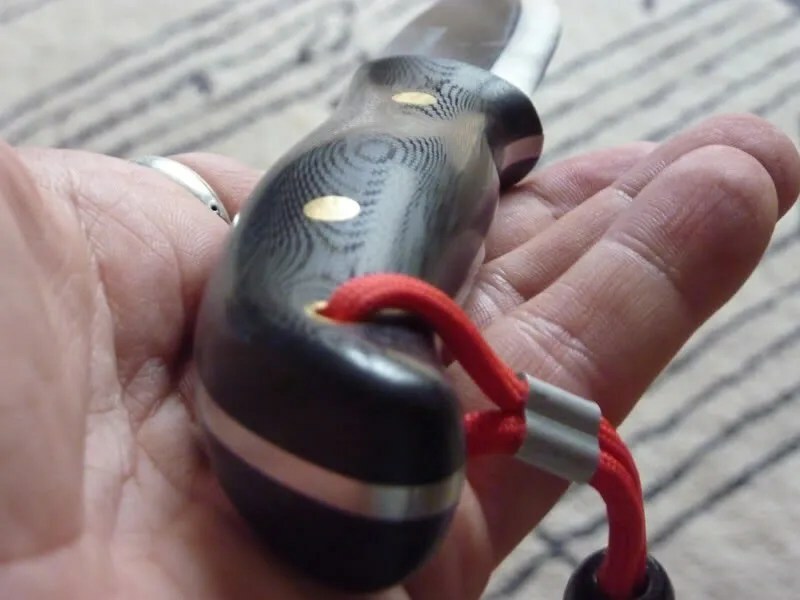 I’m not to keen on wooden handles ,for the reasons you have shown.But this G10 handle (and knife) seems to be tough..Isn’t the G10 slick in the hand? The ergonomics look fantastic…Just super.Handle ergo is very important to me.That’s what made me sell my ESEE knives..
Do you put on or two fingers in it to prevent from slipping on the edge?Or do you use it when chopping..
Can you explain a bit on this.. I’m thinking of buying this beautiful knife.The price ain’t cheap.But if all is good it’s worth it. I have changed the lanyard since. Beautifully made by my friend Jur but to short to my taste. The bean is now hanging at the sheath. Ergos are really made to use the knife all day long without any blisters. Great knife really. One of my favorite FB in my try and trust combos. Yes I read on bladeforums that the knife can be used all day without any problem(there was a strange discussion on BF about whether to buy knives from Taiwan or not) . That can’t be said of all knives.. This handle of the Spyderco Bushman G10 has very nice rounings. I already got a couple of short FB kives which are also fine,think of the Fällkniven H1(I like it better than the F1). 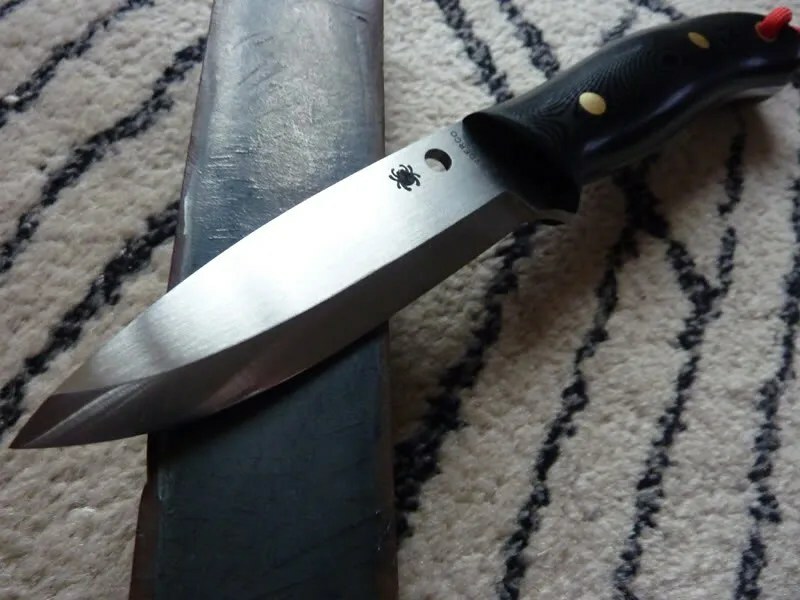 The Bushlore micarta made by Condor,the Puukko wolverine made Kellam. Sissupuukko Peltonen M07.Knives like that.I love the size.Don’t need any bigger.For bigger stuff I use the Gransfors Bruks wildlife hatchet which is awesome also. So you use the lanyard for chopping only. 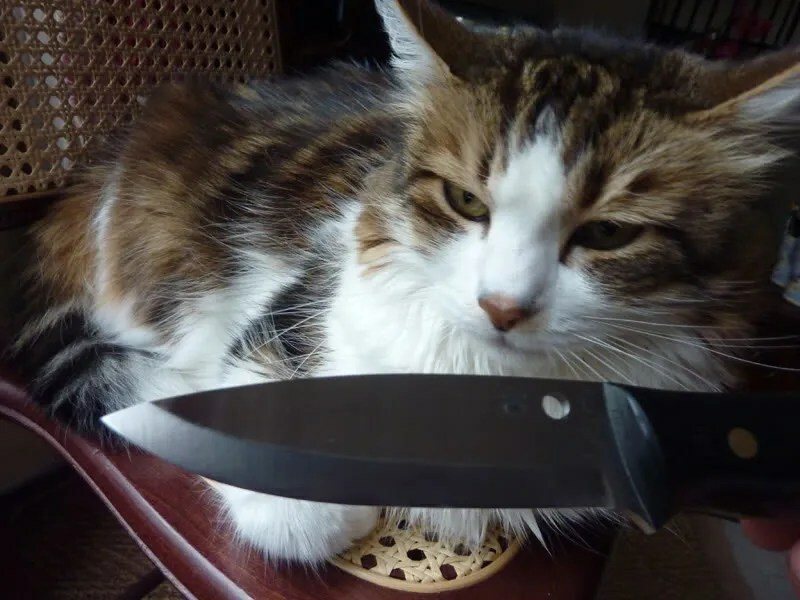 I like the pic with your cat inspecting the blade.You can definitely tell it has knowledge. What did she (?) say to you about it? I read that cats are good for people’s feeling of well being. Was written by a psychiatrist.Has something to do with the contact. Maybe not a surprise . I haven’t got an animal anymore.Used to have several.Ferret ,Rats ,Rabbit. I saw many discussion on the Blade Forums about Taiwan. There were mainly sad proofs of absence of knowledge and insulting way to show a lack of trust about Spyderco’s patriotism ! I hope now those non sense threads are buried in the dirt. Taiwanese are high gifted craftmen. Just look at the blade of the Bushcrafter, the zero grind is wonderful and on both knives they are perfect. I was introduced to Chris Reeve by a Taiwanese doctor (Hunter Hsu) who collected Sebenza. This people knows a lot about bladecraft, smithing and honor of delivering well made tools. Their knives qualities speak for themself. Taiwan has proven itself already many times I think. But some people just don’t want to know. They are a bit unfriendly towards some other countries it seems. If everybody would be like that, what a nice world this woud be..
Should I only buy European products then?How closeminded. Not only Japan and the USA are good at making quality products. I do understand that they don’t like China’s politics(Tibet humanrights etc. ).But China is not Taiwan. Taiwan is really not China. But again China is moving forward. The quality control on the Byrd knives is top notch. I got a Karakara G10 and this such a great knife for 20 euros. As solid as a Chinook. As sharp as a Tim Wegner. Great ergos. Great blade. Only 20 euros ? This is such a workhorse. European were feared by samourais because they could lunge with their rapiers and kill instantly when the “Tsuki” of the Katana got less range. So Portuguese were really feared as they could pierce the heart of their ennemy before they could slash or thrust their Katanas or Tashis. Technics in fighting or technics in making blades varies. Some celtic swords studied by scientist revealed an incredible mastership found only in legends. The same with modern cutlery. I got some Laguiole made in Pakistan and sold for 1 dollars. SMelling gazoline. They are even better than “traditionnal” Laguiole: especially their blade. I was really surprised how those cheap knives were of great quality. The same with Mora’s or cheap Helle. Wonderful knives. I know some knifemakers in Tuscany who are as gifted as the best legendary smith of the Guild. In the 50’s Japan was known for making cheap crappy tools. Go figure ! Yes I agree.China moves forward.The world is in constant change.Better not to get hung up in old negative feelings.But staying critical is also good and important. That story about the rapier vs the Japanese Katana is interesting. The rapier is a high speed weapon. Was Japanese armour not a problem for these rapiers? Low price knives doesn’t also/always mean low quality product.That’s the truth. And the other way around also. I had several Tops knives(5 different models),but found the grind too thick.Very bad cutters. Some love them.But a knife with good looks but without being good cutters/users..
Like You als like,Knives should be used.The used look,looks better. I feel the same about that. A good rapier is very capable to pierce a wooden japanese armor made to withstand the salty air. What European got are long legs when Japanese tend to have shorter legs. The Occidental fencing technics were different and the lounge was really a surprising attack which could be aimed at various part of the adversary. Occidental fencing is as complex as Kendo. I love Kendo, holding a saber with both hands. But the range is less effective than a single hand weapon made for piercing. I have one Laguiole,and they are beautiful made knives but not cheap either. Wooden armour to withstand salty air %-O ?You mean that Japanese armour was no good? Yes Japanese people tend to be short.Short limbs..That’s why they are good at speed skating for 500m but after that….nothing. And if the rapier is capable to pierce their wooden armour then the samurai definitely had a problem.Speed is one of the most important factors in battle . The Italian stiletto dagger ,the triangular one,was also made to stab knights at parts where the armour plates didnt protect their body.But listening to you the rapier could pierce that Japanese armour. Do you know if the tang of the Spyderco Bushcraft G10 has holes in it(skeletonized)as was the case with the Spyderco Bushcraft with wooden handle. I saw a thread on bladeforums,where the tang of the Spyderco Bushcraft wooden handle broke at one of the holes in the tang. The handle broke just before the tang broke. I love the knife.It cuts wood like going through butter and the grip is so comfortable. One of the best I have ever held. I did slide a racing bike inner tube over the handle.The G10 is a little slick for my taste. But the rubber tube solved the problem totally. I do his more often with knives.Nohing fancy but it works very good.